Being food and wine bloggers we get the opportunity to taste and experience many exciting flavors that most people never get to enjoy. It is really fun reporting to you about the exceptional wine, food, and places we love. 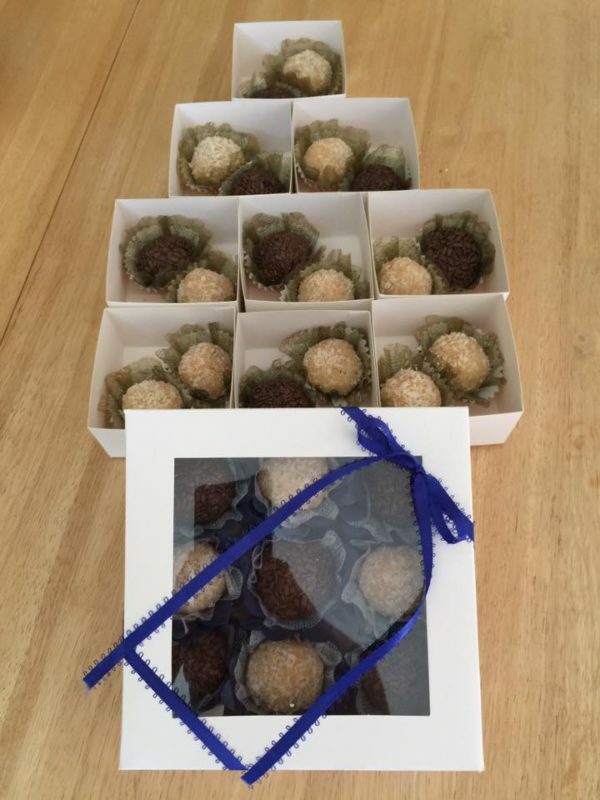 Yesterday, I had the opportunity to try some bon-bons made by Sweet Indulgence from Fairfield, California. 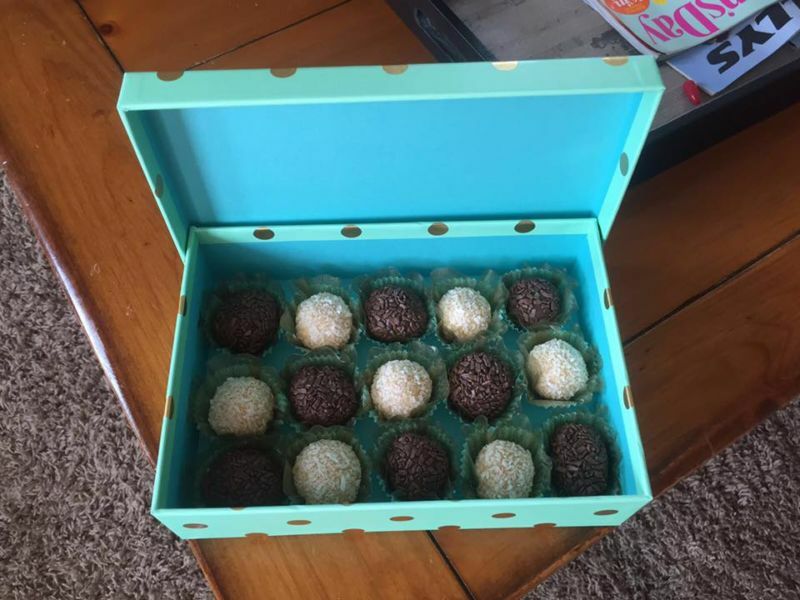 After sampling these two bite treats, (eating the entire box myself they were so good) I thought I would tell you all about them. The name bonbon (or bon-bons) refers to any of several types of sweets, especially small candies coated in chocolate. The word originated from the German language, meaning “candy” or “sweetie”. The first reports of bonbons come from the 17th century, when they were made at the French royal court. Their name arose from the infantile reduplication of the word bon, meaning ‘good’. In modern French and several other European languages, the term simply refers to any type of candy or small confection. Well that definition is interesting. I had always thought of bon-bons as either chocolate dipped ice cream balls or a sort of truffle dipped in chocolate. In this case, neither description is correct. These bon-bons aren’t what I would consider candy, cake, fudge, or a cookie either. Instead, they are a combination of all of those things wrapped up into a little ball. 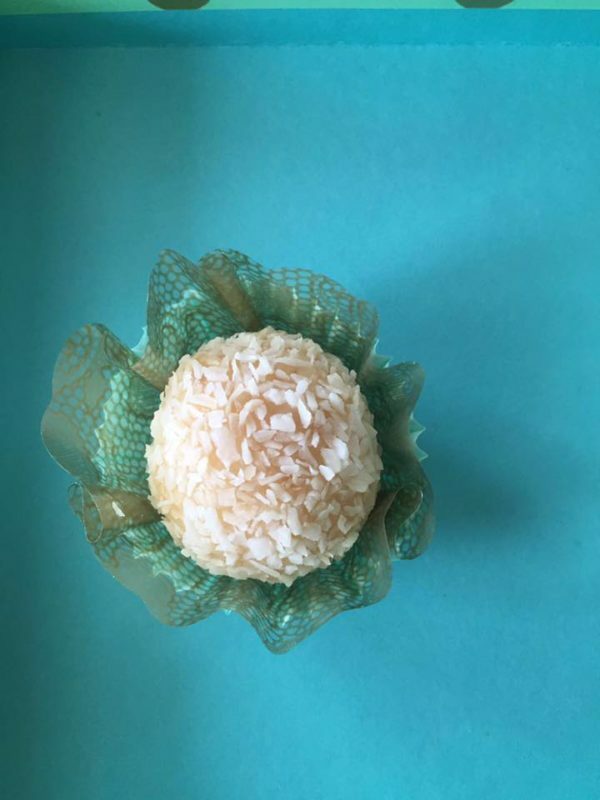 These particular bon-bons hail from a traditional Brazilian recipe called Brigaderio and are usually served at parties, weddings, holidays and special occasions. They are naturally gluten free for all of you who are intolerant or who just like to avoid gluten in your diet. Please note that they are not made in a gluten free kitchen. Tasting the peanut butter flavor is like taking a mouthful of crunchy peanut butter cookie dough. The flavor of the peanut butter truly shines. I wanted to grab for a big glass of milk while eating this bite. Mmm. The coconut flavor is amazing. You have all the richness of a macaroon, a bit of a cake like texture, and all of that sweet tender coconut in a two bite ball of yumm. 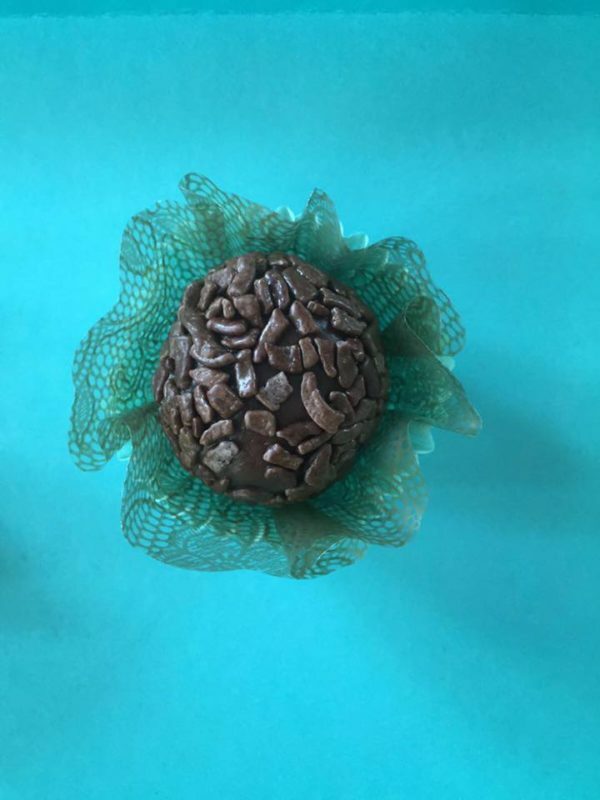 The chocolate is similar in flavor and texture to soft fudge, but less over the top sweet, and a more satisfying bite. Fudge is always too sweet for me, but these were perfect. I like the depth of flavor these have, more on the side of dark chocolate. These are beautifully rich and would be a nice finish to a fancy meal. They would be delicious paired with champagne or port. These beauties really should be enjoyed fresh. They will keep at room temperature for a couple of days in a sealed Tupperware container. They are all made to order, so you receive them perfect for your parties or as gifts. They truly are unique and special. If you are interested in getting your hands on some of these amazing treats, there is only one way now to do so. Order yours from the maker Patricia (707)438-8513. As her business is just getting started she would prefer orders by phone so she can be as responsive as possible until she can put systems in place for email and a Facebook page. I know you will be as big of fan as I am once you take a bite.